then there are a number of really good options for your home or business. First, you will want to determine how powerful than fan needs to be in order to best control the airflow of the room or space. Bear in mind that not all fans come with built in speed controls so if you need a lot of control you may need to purchase an external speed controller, depending on the fan. Should you choose to run with an external controller always check with the manufacturer which controllers they recommend otherwise you could void your warranty. Made in Germany this fan packs a punch for its size. It can move 334 CFM of air but a common perk amongst the happy consumers was that it moves more air than it seems and perhaps more than some other fans that specify a higher CFM rating. The fan comes with 3 built in speeds to control how much air you want to move as well as the ability to turn the fan off. The fan is made mostly of plastic so it is lightweight but still has a sturdy feel to it. Unlike a lot of fans, the motor does not hang off the side causing issues with the surrounding joists. It also comes with built a built in mount making this an easy fan to secure. There are also flanges fitted for the unit available for purchase. The fan has overwhelmingly positive reviews from consumers and Can Max back their product with a reasonable 5-year warranty. As far as noise goes one man’s loud is another man’s quiet. Some consumers found the fan loud while others found it to be far quieter than other inline fans. One thing I think people agree on si the fact that it is loud when it starts up but does taper off in sound once it gets into its rhythm. 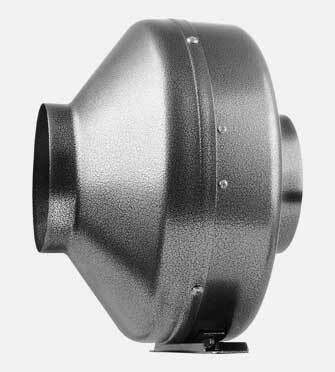 There is always the option of a duct fan muffler to control any excess noise should it be a problem. One thing of note is that the screws used are not Phillips but TORX screws. Pros: Moves a lot of air. Price. Great customer service. Built in variable speed controller. ETL certified. Coming with 440 CFM this fan, according to purchases, moves a lot of air for its size. Although it comes with a few various gripes for some purchases it does not seem to have any consistent issues. Some people found the fan quite noisy but like the Can Max the sound is somewhat subjective with a lot of people saying it isn’t that noisy. The noise is probably a byproduct of the fact it moves a lot of air. The sound rating given by Vivosun is 50dB. It comes with a variable speed controller which is useful for changing the airflow to suit your needs. There is also an off setting. The fan has to be turned on to work and is not triggered automatically by airflow. The most comforting thing about the fan is that for customers that did have issues, their problems were taken care of quickly by the friendly customer service. Along with the great customer service, the fan is ETL certified guaranteed. The power rating is 120W with the fan speed reaching up to 2450 rpm. Cons: No built in speed control or timer. Moving 347CFM and using 66 watts according to Vortex, this fan has a lot of happy customers. 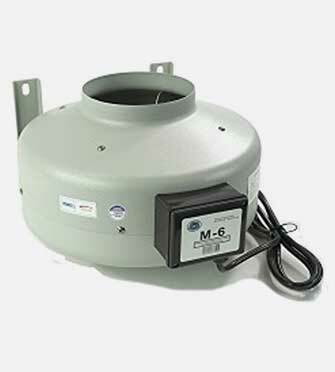 The fan comes with an extremely energy efficient AC brushless motor which, along with the built in double insulated walls really contributes to the minimal output of sound for a fan of this size and power as well as preventing condensation. Also built in is an internal impeller which helps cool the fan in order to expand the fans lifespan. To check out what is inside the fan check out this useful diagram. 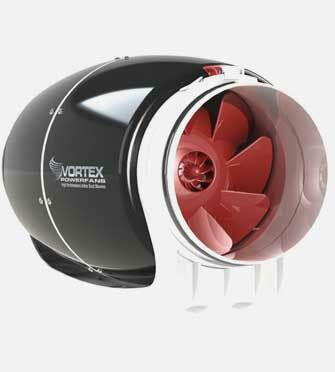 One thing that a number of consumers of the fan say about the Vortex duct fan is that is very well made and pays very good attention to the detail in its form and function. The fan runs on 120V. Though the fan does not have any built-in speeds it is still able to have its speed controlled by an external controller. The manufacturer requires the controller to be a solid state controller otherwise your fan is not covered under the warranty.Supposedly the manufacturer recommends the Dial-a-temp speed controller for these fans. There is also no timer or thermostat which is fairly common for these fans so if you are looking for these features you will need to find an external unit to control these features. Another of the most common comments about this fan is that it is very quiet. As above the quietness of a fan is subjective and although a few people said this fan was a little noisy, overwhelming consumers did find this fan extremely quiet. A plus with this fan is that it has a clipping system which makes it easy to remove the fan for any cleaning or maintenance you might need to do on the fan. If the features of the fan are not enough, the fan comes with a whopping 10-year warranty. Below is a good in-depth review of the Vortex 347 and its features including a volume test against another similar fan. Pros: Price. High CFM and blows well. This is one of Amazon’s best sellers in the inline duct fan category, though I suspect a lot of the ratings are combined with ratings of a package which includes the carbon filter, so be aware of that if you are looking on Amazon. Having said that the ratings are still very good. The fan itself moves a good amount of air with 442 CFM. The noise level is stated by the manufacturer as here, however, a common criticism that came up in reviews was that it was quite noisy for some people. 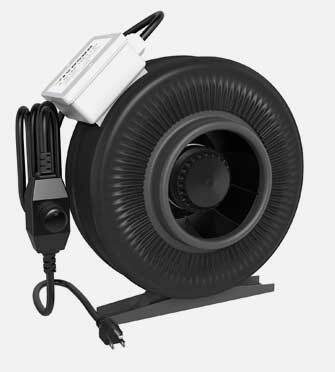 The fan comes with a Pre-wired 5-feet power cord and runs on a 110/120V standard household plug. Inside the fan comes with UL components along with a permanently lubricated bearing that requires zero maintenance for a longer lasting lifespan. It is also a brushless unit. It does not have a built-in speed controller but it is certainly compatible with one. It is always best to check with the manufacturer as to which ones are recommended. There is no on-off switch so if the airflow is too much or too little unfortunately you will have to invest in a speed controller. The iPower GLFANX 6 inch duct fan comes equipped with clamps however a number of purchases mentioned they had trouble with the placement of the clamps. Some people found them hard to adjust and not well placed. Another thing people mentioned was the size of the fan is actually quite large. It measure 11 x 14 x 15.5 inches. The fan is made in China and comes with a 1-year warranty. It is a lot cheaper than some of the above fans. 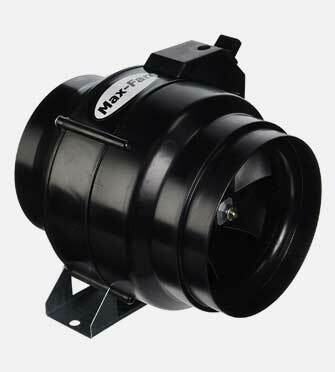 The Tjernlund M-6 Inline Duct Booster fan is a powerful fan that pushes 460CFM. Most consumers of the fan agree that this fan pushes a large amount of air which was a big positive for most. If you are needing adjustable airflow control you may need to get a speed controller as this fan does not have any built in. It is a 120V fan and is specified as 125W and 1.1amp. The fan comes with mounting brackets included for easy installation. It has a mid-range price tag for an inline duct fan and it comes with a 1-year warranty. Have you purchased any of these fans? If so what are your thoughts and experiences with it? We would love to hear from you.